MAXIMUM COMFORT: Luxuriously soft materials with all season weight siliconized fiber filling providing a comfy nights sleep all year round. PREMIUM QUALITY: Crafted with care from our superior ultra-soft double brushed fabric, allergen free hypoallergenic, wrinkle resistant, fade resistant, and environmentally friendly. EASY CARE AND MAINTAINENCE: Easy care machine wash on gentle cycle with cold water, air dry or tumble dry on low when needed. 1 Comforter 66" x 92"
1 Comforter 88" x 90"
1 Comforter 104" x 90"
Love my new comforter it is large enough for the whole bed. Hard to find that with a cal king bed. Nice, soft and cozy. Up here in northern Maine, winter nights can get, shall we say, challenging? 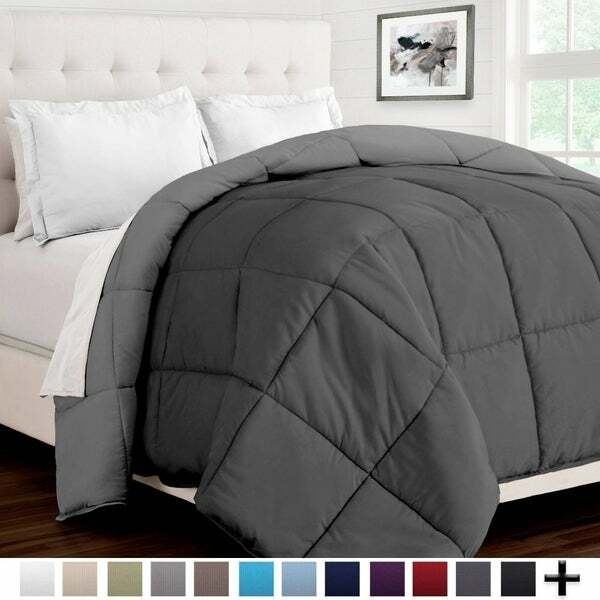 This comforter has been an outstanding performer at maintaining snuggly warmth. I would definitely recommend this to anyone, friend or not. If you want to be very comfy on a cold night, this is a good choice. Humans and cats give it all thumbs up! I'm really pleased with this comforter. I had bought a different down alternative and it wasn't nearly warm enough for fall/winter. This one will be. Very attractive blue/grey combo too. Exactly as I expected! Came on time and is perfect for my son’s dorm. It is long enough for the extra-long dorm room beds. It came vacuum packed so it was very easy to transport. This comforter sheds filling and has little white tufts of it all over. It is very warm in this cold spell we are having but it is very light weight. I don’t like heavy covers. Very cozy. This pills alot when you wash it! Can only use the one side for color options since the other side is so badly snagged and pilled. Would not recommend. "What is the fill amount?" Loved the previous order. Good quality!